Explanation: Sprawling spiral arms dotted with bright red emission nebulas highlight this new and detailed image of nearby spiral galaxy NGC 2403. Also visible in the photogenic spiral galaxy are blue open clusters, dark dust lanes, and a bright but relatively small central nucleus. 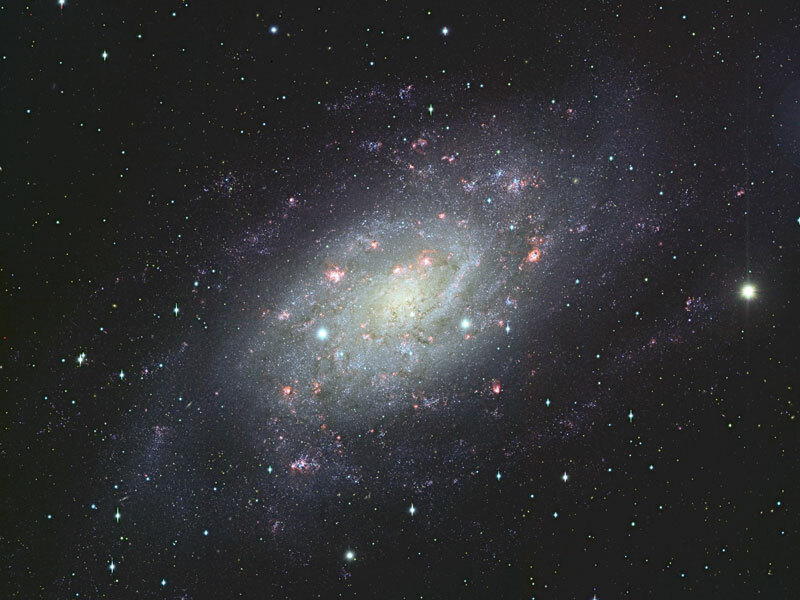 NGC 2403 is located just beyond the Local Group of Galaxies, at a relatively close 10 million light years away toward the constellation of the Giraffe (Camelopardalis). NGC 2403 has a designated Hubble type of Sc. In 2004, NGC 2403 was home to one of the brightest supernovas of modern times. The above image, the highest resolution complete image of NGC 2403 ever completed, was taken by the Japan's 8.3-meter Subaru telescope located on Mauna Kea, Hawaii, USA.